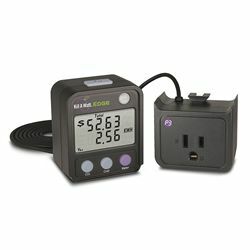 Gain insight on your home's electrical consumption with the Kill A Watt Edge, a kilowatt meter that tells exactly how much power (and how much money) any 110V AC device is using. The Kill A Watt Edge uses a built-in motion sensor to combat a device that is in "standby" mode: theoretically off but still consuming power. After everyone leaves the room, the monitor cuts power off to the device; power is restored again upon detected movement.